I am a big fan of Rose Bakery. An English bakery that first opened in Paris and is now dotting Tokyo. This casual cafe has a large delicatessen-style refrigerator in each shop that showcases the colorful salads and baked goods. While the cakes and sweets are tempting, I am always come here for the salads. 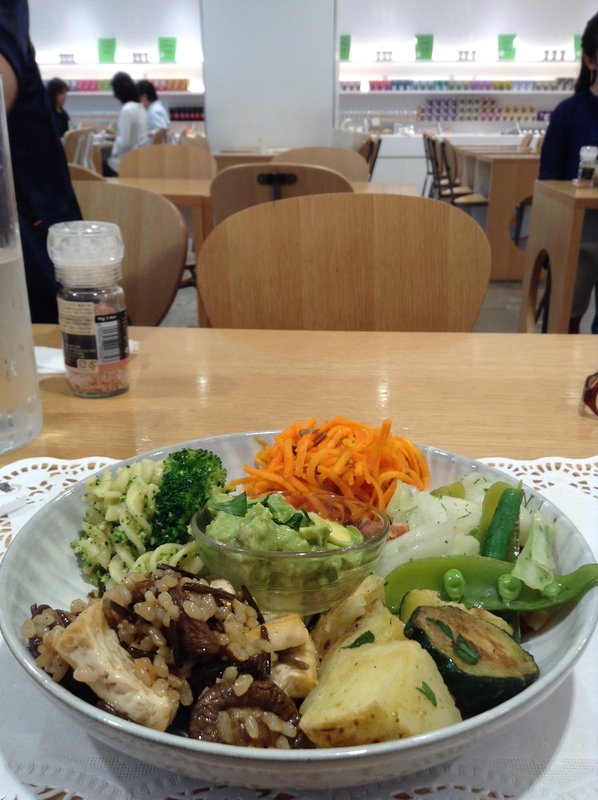 This Plate of Vegetables is about 1,550 JPY at the Ginza shop and was 100% vegetarian. Six vegetable dishes served with a side of rustic sourdough bread. The Kichijoji branch, which I go to more often, sometimes includes some chicken or anchovies in the Salad Lunch, so be sure to let them know if you prefer all vegetables as I believe they could accommodate your request. The Ginza shop which is in the fashionable Dover Street Market, was just the opposite. Hip and stylishly dressed diners and shoppers with their shopping bags from high-end designers. Many times our clients tell us that they are craving vegetables. This is a great spot to get your fill. There is a second shop in Tokyo center in Marunouchi in the Commes des Garcons shop. The selection of salads and sweets is not as big as the Ginza branch, but the location is convenient to Tokyo Station. The menu is also smaller than the Ginza branch, but it does have a lunch salad of three different salads. Ask the staff to add a fourth salad for about 100 JPY.